The end of September by the way of a period devoted to beer after the summer holidays and the return to reality two days in the company of the blonde drink does not hurt anyone. If you know a bit of Munich and you have Oktoberfest in memory then do not worry: there are other cities that organize their Oktoberfest. The Bavarians are officially recognized by the parent company, thus having a structure that respects the traditional norms. If you are planning on watching football in a sports bar then these festivals are not for you because you will only drink massive amounts of beers. We start from Stuttgart: Cannstatter Volkfest is the second largest beer festival in Germany, ready to welcome more than 4 million visitors a year. Many of these are Italians, eager to change the destination after several alcoholic adventures in Munich. This festival has its roots, however, different from the Oktoberfest: in 1818 King William decided to organize a big party for the people to prevent the destruction of the crop of the previous year. Since then, games, rides, music and dancing pattenrs are accompanied by beer mugs and the beginning of autumn color in Stuttgart. This year it will start in September the 28th and will close on October the 14th. 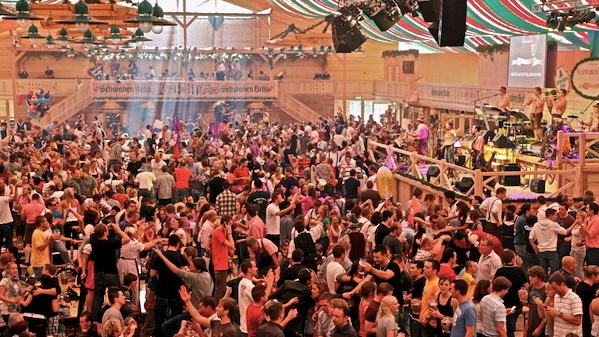 The Marco Polo German Bierfest takes place in Hong Kong and it is held every year in the Marco Polo Hotel, in a large tent that can accommodate up to 1,500 people. For the 2013 edition they will start in October the 19th, to continue unabated until the 10th of November: every evening are provided Bavarian dances and music, accompanied by gallons of beer. Also in Cincinnati is celebrated the fest: in 1976 was discovered the Oktoberfest Zinzinnati, the second largest in the world. Fifth Avenue will be crowded with 500 thousand people: on stage on the 22nd and the 23rd of September. The fest will start with the Chicken Dance: a collective dance entry in the Guinness Book of Records with over 48 thousand participants. In 1969 began the tradition of the Kitchener-Waterloo Oktoberfest: in that year were celebrated for the first time the German roots in the twin cities of Ontario, Canada. They have a record of 700 thousand annual visitors, and this year will take place in October the 5th to the 13th, with an exceptional godmother who is chosen as the symbol of the event. This is Miss Oktoberfest. Close back to Italy, in Liguria: it will be open in September the 20th the eighth edition of Genoa Oktoberfet, which began on the cue of Hofbräuhaus, a historic Bavarian brewery in the city of Liguria. So it is celebrated in Victory Square for ten days. Prepare your jars.